The SLMPD Aviation Unit operates as part of a multi-jurisdictional unit known as the Metro Air Support Unit. This Unit is composed of the Metropolitan Police Department, City of St. Louis as well as the St. Louis County Police Department and St. Charles County Sheriff’s Department. The arrangement with the other agencies affords the Unit the ability to provide around-the-clock aerial coverage while patrolling the 1,600 square miles of the combined jurisdictions. The Aviation Unit was formed in 1996 after acquiring a military surplus OH-58 helicopter. It continued as a one helicopter and one pilot operation until 2004. 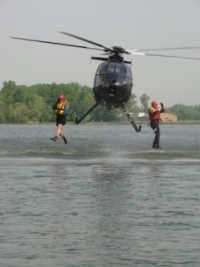 In 2004, the SLMPD Aviation Unit, along with the St. Louis County Police Department and the St. Charles County Sheriff’s Department joined forces, forming the Metro Air Support Unit. The Unit is under the command of a St. Louis County Captain. It is comprised of a SLCPD sergeant, three SLCPD police officers, two aircraft mechanics, a SLMPD sergeant, four SLMPD police officers and one SCCSD deputy. Each flight crew consists of a pilot and a tactical flight officer. These officers utilize the latest state-of-the-art equipment when carrying out their missions. They operate MD 500E helicopters as well as ex-military OH-6A helicopters. The MD 500E helicopter was chosen by the Unit due to its fast, agile and mission-oriented capabilities. The Unit also utilizes a Cessna C-172 fixed-wing airplane for investigations and surveillance. The Metro Air Support Unit trains extensively throughout the year. The Unit trains with SWAT, Canine and multiple fire agencies on a regular basis. We have undertaken addition responsibilities with the United States Coast Guard and the Environmental Protection Agency.